The days of pushing corks in with spoons, gently tapping bottles on walls wrapped or simply smashing the neck to desperately glug the alcoholic grape nectar within may be over. 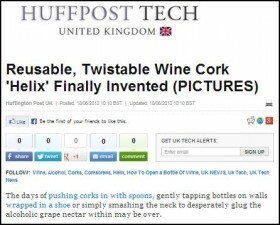 A new twistable and re-useable cork called the Helix has just been unveiled begging the question - why has it taken so long? A thread around the side of the cork mirrors one in the neck of the bottle and allows for twisting. Additionally, the traditional cork material and airtight seal prevent the wine from going off. The stopper is the result of a four year collaboration between Portugese cork manufacturer, Amorim, and American glass maker O-I. The makers are aiming the product at the £5-£10 "popular premium" wines meaning you may be able to raise a glass to this dinner party saviour sooner than you think. The world’s largest manufacturer of cork stoppers, Amorim (Euronext: COR) has over 140 years’ experience of serving wine producers. Owens-Illinois, Inc. (NYSE: OI) is the world’s largest glass container manufacturer and preferred partner for many of the world’s leading food and beverage brands.